The Wooden Chicken at 12500 NE Sandy Blvd: where the hell did he come from? 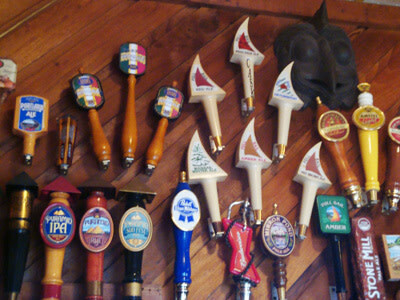 (Center) Some of the 2,000-plus taps that adorn the walls. (Bottom) Yes, Greg Biffle was here! I’ve lived in Portland for 15 years so I like to pretend that I know my way around. And when it comes to downtown and most Southeast locales, I’m on solid footing. But I’m inexplicably drawn to the hinterlands, those little pockets of Portland and the outlying areas that resolutely continue to hock a loogie at any earnest effort to become more cosmopolitan. Perhaps due to my own hayseed upbringing (a shout out to all my Coos Bay homies! ), I can easily morph into small-town mode when I find myself away from the urban center. I just put on a ball cap, keep my eyes on the floor, and make sure every third word is a profanity. Picture a Transformer that reconfigures itself from a Lexus to a riding mower. I was way out Sandy Boulevard in the Parkrose ‘hood the other night with a fellow nightlife ne’er-do-well, looking for someplace to quaff a brew or two when we stumbled across a neon sign that hooked us like a pair of thirsty rainbow trout. “What the hell’s the Wooden Chicken?” I asked Lucy. Since she’s lived here a few years longer than myself, I figured she knew all about it. She merely shrugged. We pulled over so I could get a picture of the sign, but we weren’t sure what to do next. Finally this bit of infallible logic won her over. “C’mon! 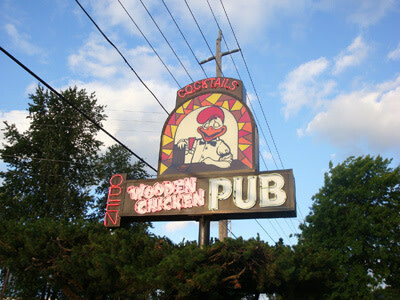 If you see a sign for a place called the Wooden Chicken, you damn well better go in,” I argued. So we did. I was expecting a little squatter’s shack populated with barefoot guys called Zeke, Abner, and Rufus, tending a Rube Goldberg moonshine device, but the Wooden Chicken is a tidily rustic and spacious sports bar with a dozen or so screens tuned to the NASCAR network and 75¢ tacos on Tuesdays. And then there’s the beer taps. The dominating decorating motif here is a cornucopia of beer taps (sadly not connected to kegs) on every imaginable inch of wall space. 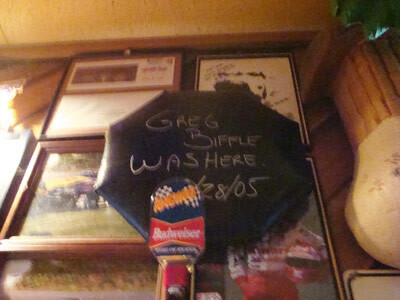 Oh, there’s also a bar stool bearing Greg Biffle’s autograph. Ask your Uncle Red who he is. “Wow, how many taps are there on these walls?” I wondered aloud. “The last time we counted there were 2,137,” replied the bartender. “But there are always more coming in.” That was the first of two burning questions answered. The other? OK, historically minded drinking buddies, help me out. What is the origin of the Wooden Chicken name? I’ll settle for interesting made-up stories. Yes, this is a competition and two winners will receive a valuable prize from me, the Bar Pilot: one winner for the actual origin story, and one for the most compelling fabrication. Go!